To continue my theme of all things pumpkin and excitement for the upcoming holidays, I woke up craving pumpkin pancakes! Skipping down the hallway to my kitchen, I gathered my ingredients to make a paleo, grain free, gluten free, low carb, sugar free festive fall breakfast. 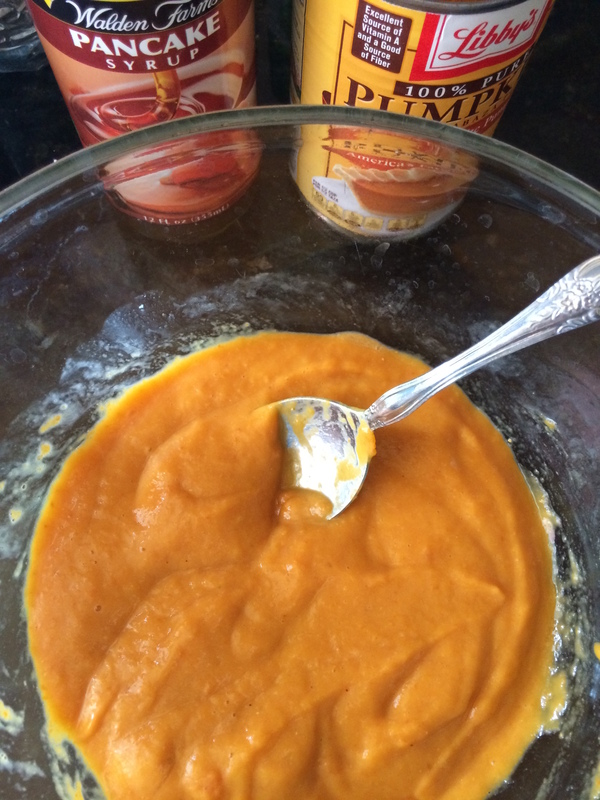 Mix pumpkin puree, almond milk, eggs, syrup, and vanilla extract together in a bowl until smooth. Whisk coconut flour, baking soda, salt, almond flour, cinnamon, pumpkin spice, and cacao nibs (optional) together in a separate bowl. Stir pumpkin mixture and flour mixture together until well incorporated. *Add more almond milk or water to the batter if the mixture it is too thick. Heat coconut oil in a skillet over low heat. Pour circles of batter into the hot oil. Cook until lightly browned, about 5 minutes per side.